I have been blogging for over 5 years and one thing I have learned to keep this a sustainable hobby is: don’t sweat the small stuff. This recipe has been sitting in my draft folder for a while and I keep on hesitating to share it with its lackluster photos. However, the recipe is stellar and for some reason, once the snow hits, I am all about the tropical eats. I used canned beans here. 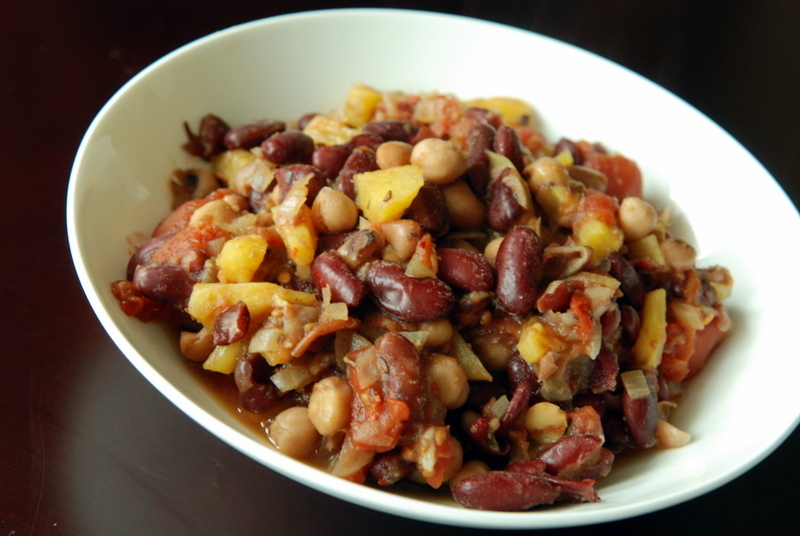 One can of red kidney beans (they never seem to get too much love in my kitchen) along with mixed beans (who remembers my Symphonic Mixed Bean Salad? 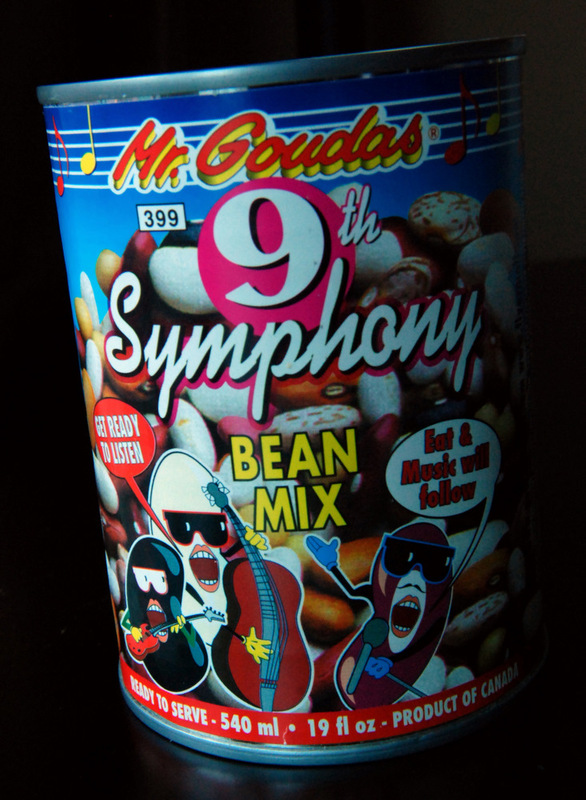 With Mr Goudas’ 9th Symphony Bean Mix? YAH!). It still cracks me up: Eat and music will follow. Get ready to listen. I swear, it is written on the label. it almost sounds like Trader Joe’s would love. In any case, the beans are mixed with a lime infused tomato broth spiked with pineapple and spiced with oregano and a hint of chile flakes. 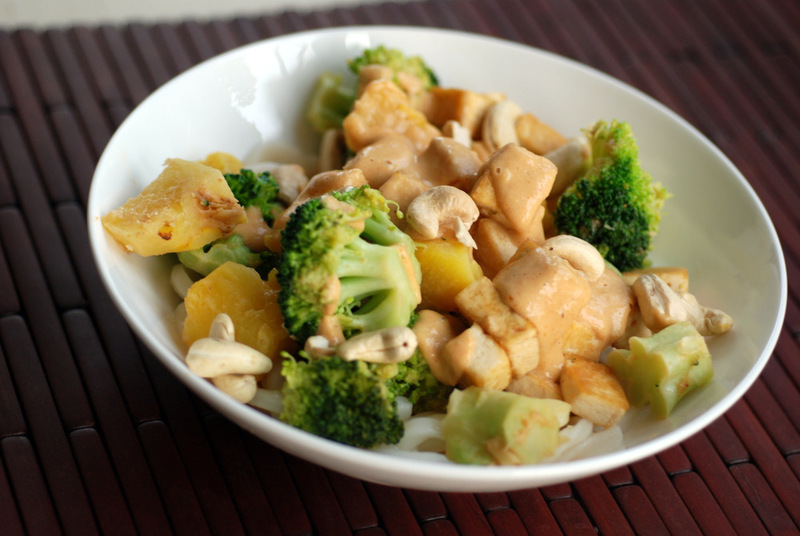 Serve with your favourite grainy side to sop of the juices. PS. 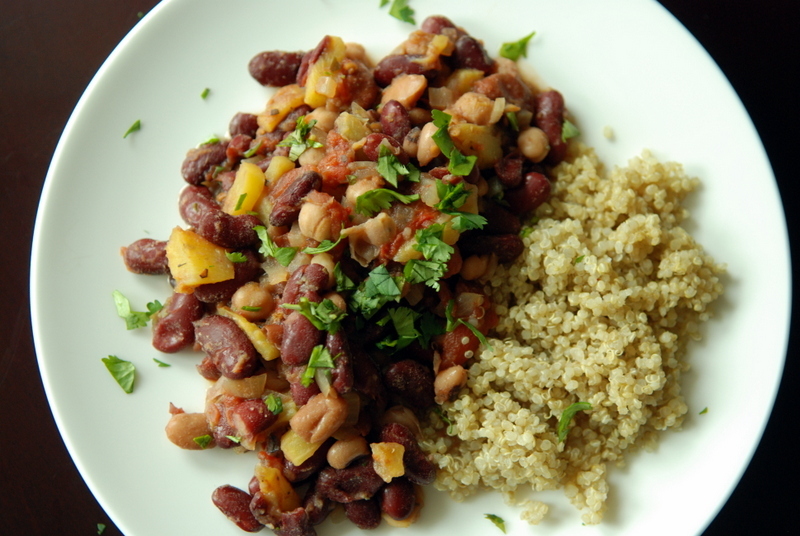 I am sharing this with this month’s My Legume Love Affair and Simple and In Season. Houston played a cruel joke on us earlier this week. If you thought it was hot outside, it was more hot inside our home. While not too hot outside (highs of 90F/32C), inside our home, it was 86F/29C. It was still 86F inside, after an overnight low of 80F/27C. Yes, our air conditioner had stopped working. Rob suffered the brunt of it, as he stayed at home (to work) and to greet the 3 separate repairmen. The first 2 could not reach the roof with their ladders. Thankfully, the third team was a charm. By this time, it was closer to 9 pm at night but when the cool air began to circulate through the house, it felt like heaven. Truthfully, I had a long day at work but I was not rushing back to a hot and humid home. When I finally arrived, all I wanted was a cool drink. We have almost finished the frozen fruit in our freezer and this certainly hit the spot. 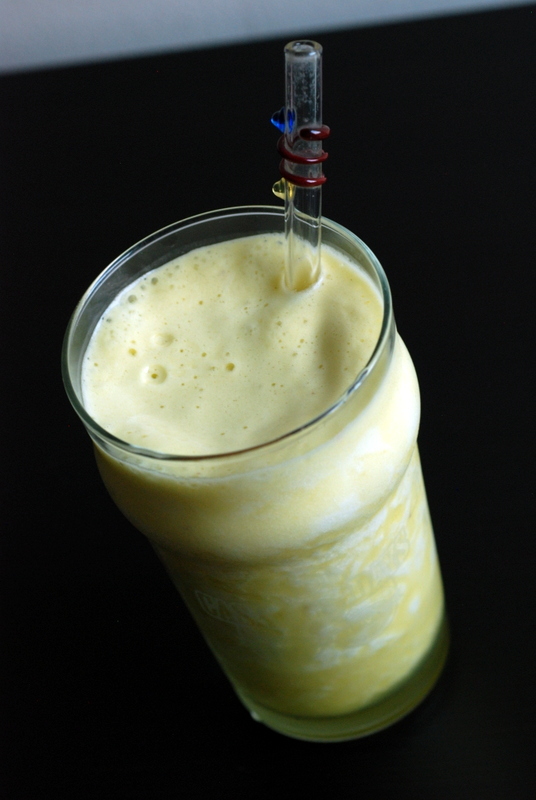 I would not have considered something so simple as pineapple and mint, but while we were in Toronto last week, we sampled a delicious pineapple-apple-mint juice from Yam Chops. Imagine my surprise after a quick spin in the blender, the froth had taken over. It was glorious! It settled a bit as I went looking for my camera, but I think you get the idea. Definitely the epitome of a frothy drink. I am sharing this with Cooking with Herbs. Sunday isn’t even over and I feel like this was such a productive weekend. We still did some zooming this weekend, though… On our bikes, we zoomed over to our closest farmer’s market and caught up with a friend while dining at Live for brunch. Sadly, my tofu scramble was terrible (burnt combined with tasteless) but the delicious Black Forest Cherry Chocolate Cheesecake almost made up for it. I did some grocery shopping and cooked up a few meals for the week in the afternoon. For dinner, Rob and I had a picnic in a nearby park. Just because we could. By the end of the night, we also managed to finish watching the last season of Dexter. Can anyone recommend a show as awesome as this one? Otherwise we will have to wait for the new season to start up in September. In any case, this is my Random Recipe for the month. 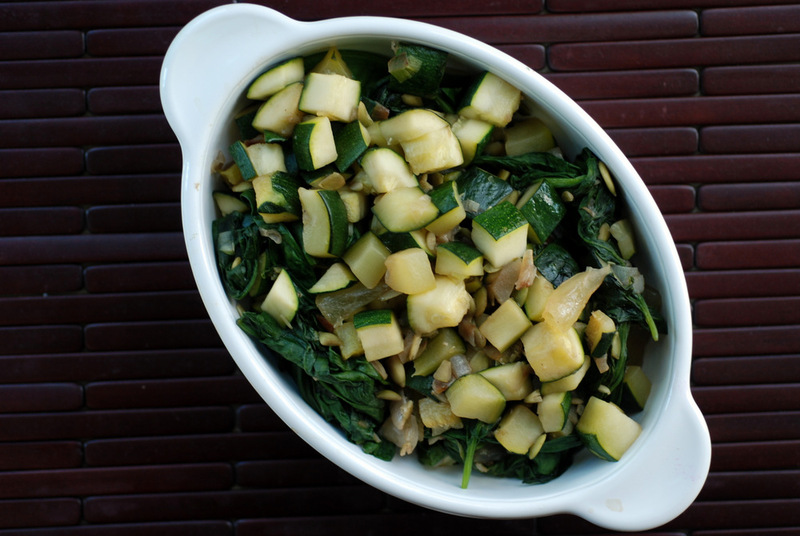 A random recipe from a random cookbook brought me to Donna Klein’s African-Style Spinach and Zucchini Sauté with Pumpkin Seeds and Dried Pineapple from The Tropical Vegan Kitchen. 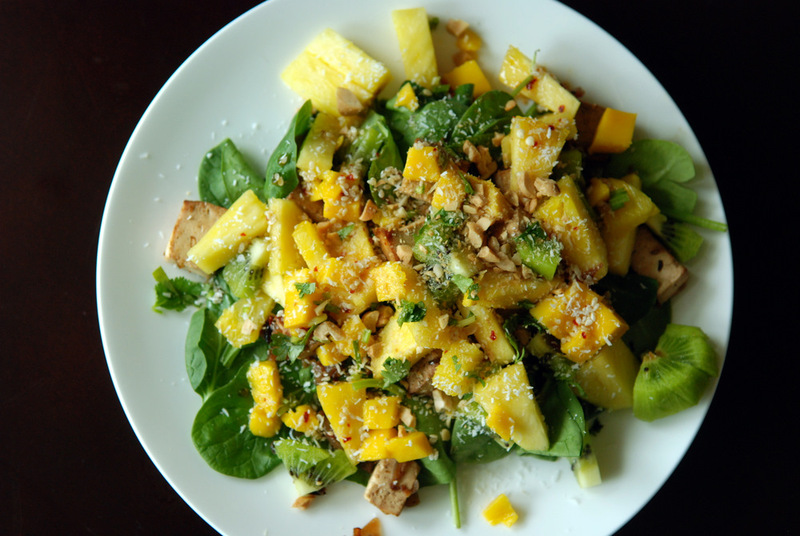 I never would have thought to combine the greens with the sweetness from the pineapple but it worked nicely together. It was quick to come together and was nice, cold, as leftovers with a side of quinoa. Next time, though, I’d add my toasted pumpkin seeds at the end so they stay crunchy. There are many differences between Canadians and Americans. One definitely is due to the Mexican influence on Americans. Despite posting a few Mexican recipes, I don’t really know much about Mexican cuisine. Like hummus, everyone has their favourite guac recipe. I haven’t experimented much but I loved this creamy guacamole with edamame. You see, I don’t buy avocados that often. They are expensive in Canada. I know they are ridiculously cheaper in the US, especially in the Southern states. But for some reason, they have been on sale recently so when Rob went grocery shopping, he came home with over 10 avocados. We were obviously making guacamole for his party! While the brisket and BBQ jackfruit tacos received high praises, I think this guacamole stole the show. It was the winner of the night. I want to call this a nontraditional guacamole because it is stuffed with pineapple and cucumber. However, since it is adapted from Truly Mexican, it is probably more authentic than you think. 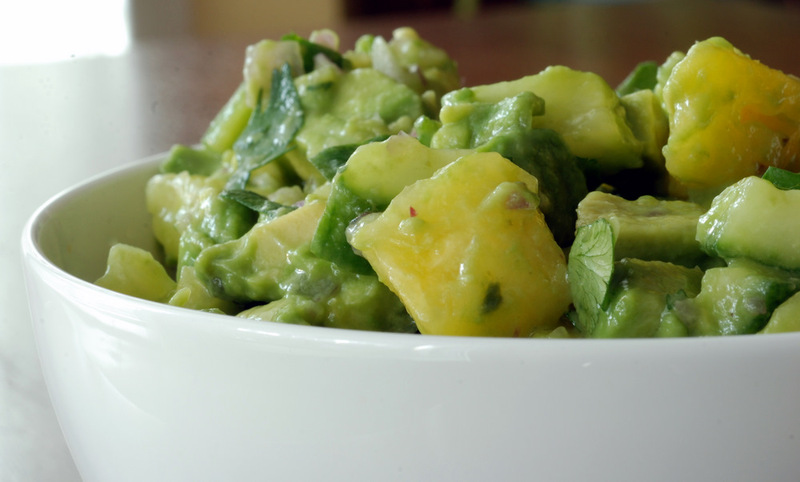 Mexicans know how to accentuate the already delicious avocados into a sweet and spicy salad. Chunkier than your mashed guacamoles, you have a mingling of sweet pineapple chunks, cool chopped cucumber and chunks of avocado bathed in a lime-chile marinade. 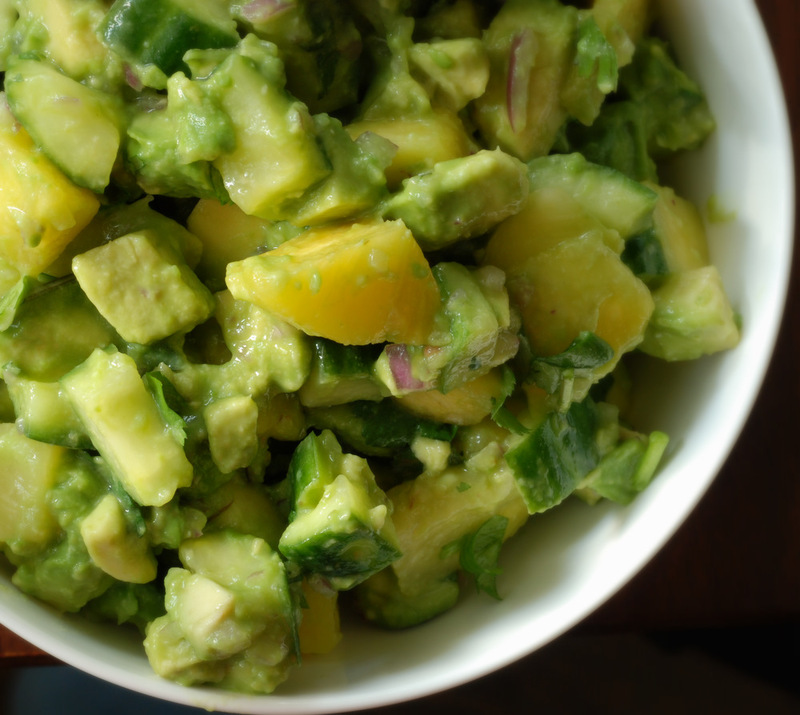 Due to the acidity from both the lime juice and the pineapple, this is a guacamole you can make in advance and not worry about it turning an ugly brown. Make sure you have large chips to scoop up this guac, or if you’re like me, make it into a wrap! 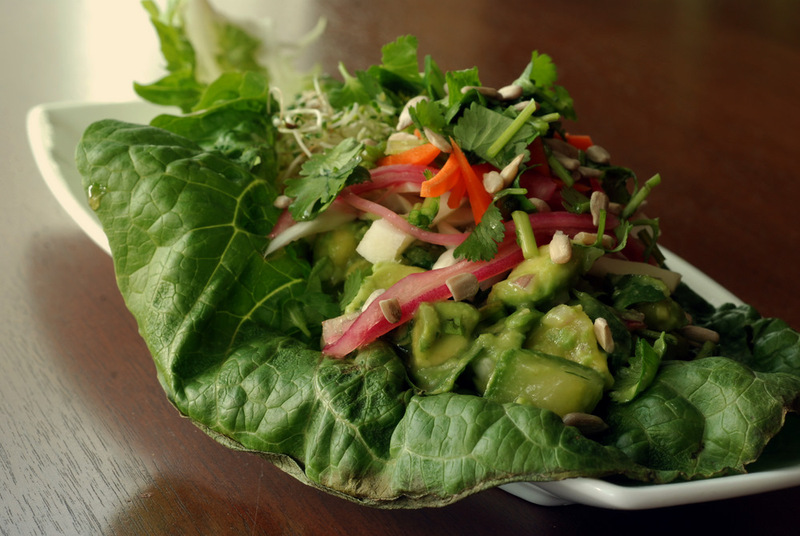 Load a Romaine leaf with guacamole, and top with your favourite toppings – I chose julienned cabbage and carrots, chopped cilantro, pickled red onions, alfalfa sprouts and sunflower seeds. Don’t have any fixings? It paired beautifully with the BBQ jackfruit as well. This is being submitted to this month’s Simple and In Season, to this month’s Herbs on Saturday bloghop, to this week’s Weekend Wellness, to this month’s Ingredient Challenge Monday for pineapple and to this month’s Gimme Green event. I know the days are getting longer, but I go to work and it is dark. I come home from work and it is dark. As much as I love winter with its bright snow and clear icicles (not happening so much as I would like here in Toronto, btw), all I want is some sunshine. Some people head south for some sun and warmth. Me, I cook it up in my kitchen. For some reason, as soon as the weather turned cool, I turned to Caribbean dishes – bright with their flavourful ingredients, warmth from the spice and much cheaper than a trip down South. 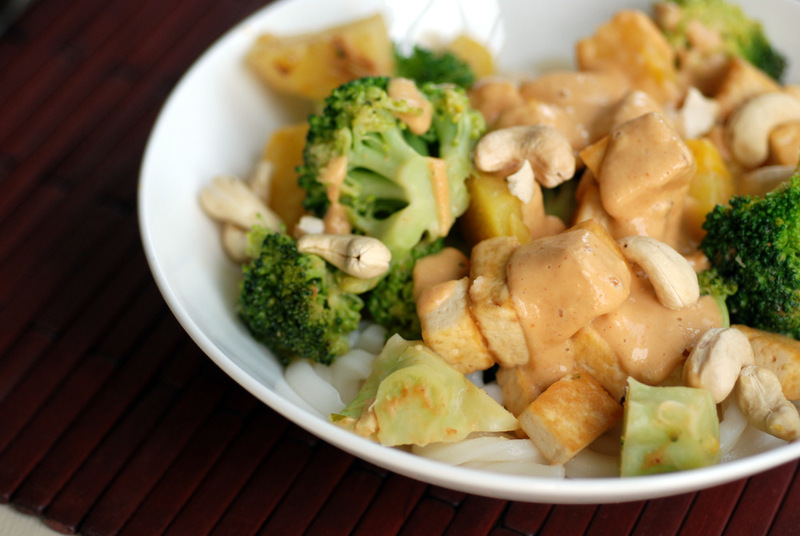 This is a curry I spotted on Natalie’s lovely blog, Cook Eat Live Vegetarian, and again it passed my checklist for Rob: tamarind, coconut, curry, sweet potato (or squash) and pineapple. In fact, the ingredients look so similar to that delicious Butternut Squash, Coconut and Lentil Stew, but this is anything but similar yet equally as delicious. 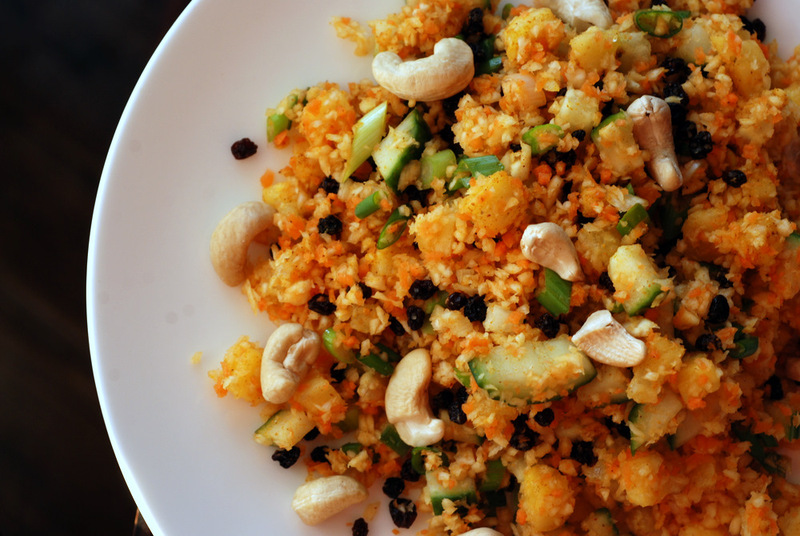 Natalie explains that this curry originates from Martinique, an Eastern Caribbean island, that has elements from Africa, France, the Caribbean and South Asia in its cuisine. The distinctive flavours come from the Colombo spice mix that includes cumin, coriander, mustard, fenugreek, black peppercorns, cloves and turmeric. 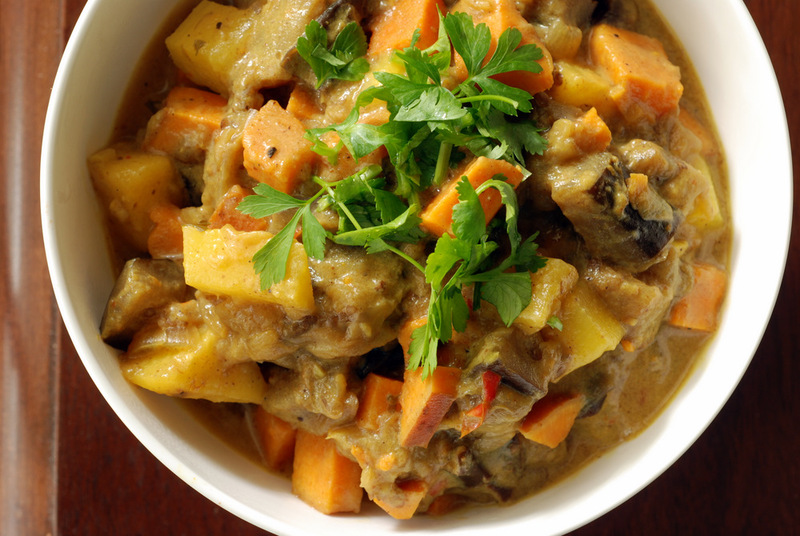 The curry gets its heft from starchy sweet potatoes, but butternut squash could equally be used. 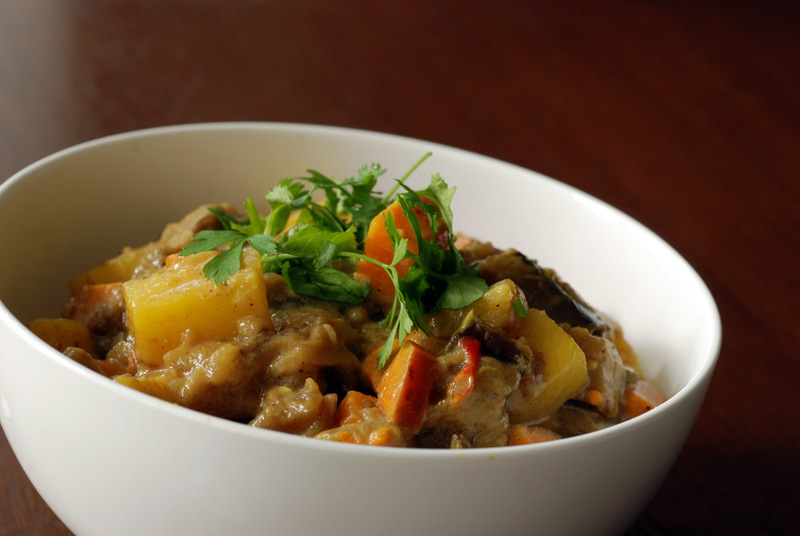 The eggplant melts into the coconut-curry broth, tangy from the tamarind and lime juice. As we are apt to do, we increased the tamarind. Bring the warmth into your kitchen this winter, with a virtual trip down South. Although it will appear very real once you slurp up this delicious curry. This is my submission to Deb for this week’s Souper Sundays and to this week’s Wellness Weekend. Bell peppers come in a variety of colours – green, yellow, orange and red. How are the multicoloured peppers different? I am not as fond of of green peppers since they are more bitter. I will, however, tolerate them if hidden in a larger dish. Green peppers are harvested before they are completely ripe and will never become sweet, like its older colourful siblings. Yellow and orange peppers are more mature than green, but the most mature of all are the red peppers. With maturity comes hidden specialties, right? Of course! After researching a bit, I found out yellow peppers have 3% of the recommended intake of vitamin A, versus 105% in red peppers. Vitamin C was nearly the same between yellow and red (although green peppers had half as much). But red peppers have 841 mcg of beta-carotene versus 110 mcg in yellow peppers. They say to eat a rainbow, but I think it just makes sense to eat red peppers! Thankfully my taste buds agree and my blog can attest with its multitude of recipes for bell pepper. The real question is whether to plant bell peppers in the garden. Our friends (and landlords) had difficulties with bell peppers last year, and other gardeners in Toronto have told me they never fully ripened to become red. The scourge of a short summer. The quandaries… perhaps we won’t be planting bell peppers if they stay green. Who would eat them? Only if they were hidden inside this delicious dish! 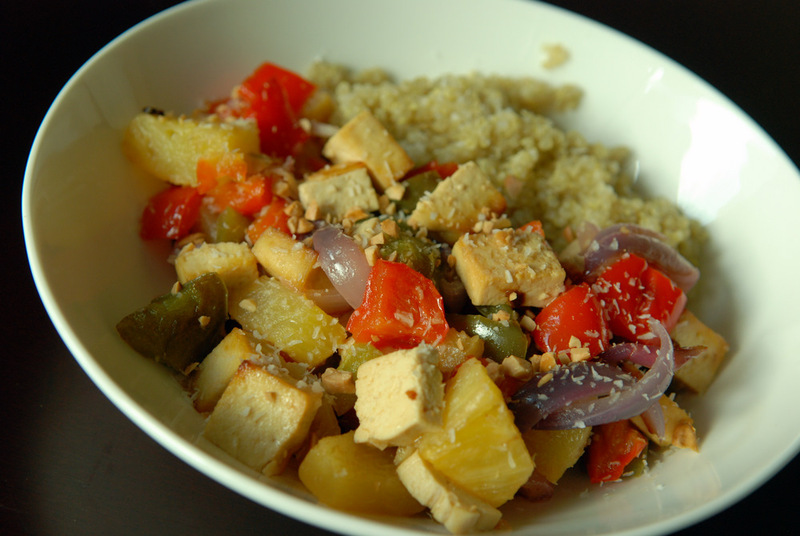 Yes, I really liked this Hawaiian Roasted Pineapple with Red Peppers and Tofu. It wasn’t one of those ooky-sweet sweet-and-sour sauces. 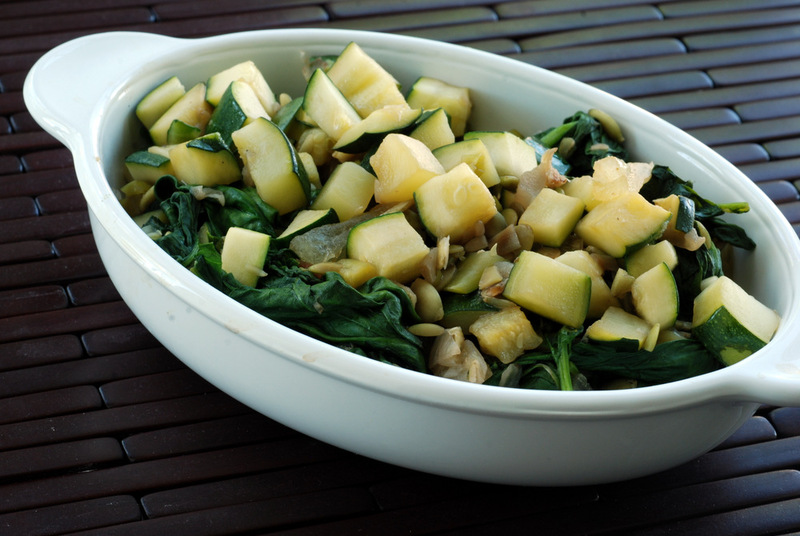 It was light, tasty and fresh, without any cornstarch which plagues most recipes. 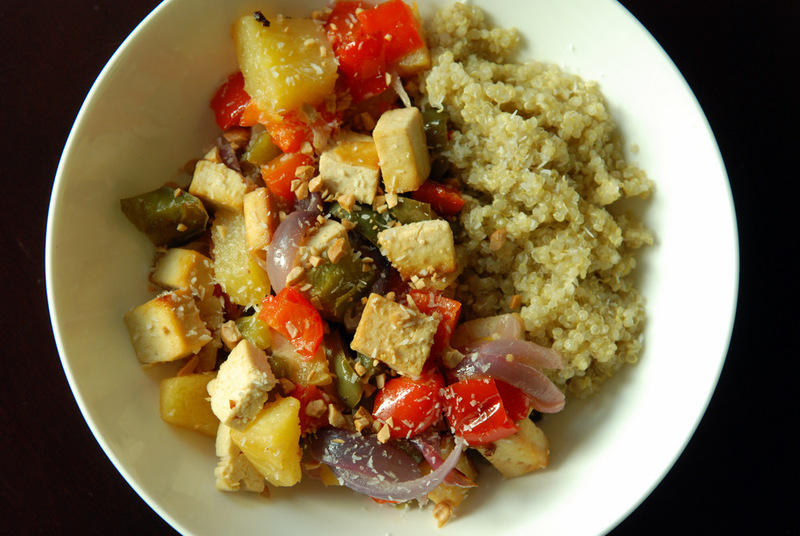 Originally a vegetable side dish, this recipe was adapted from Supermarket Vegan (also posted on Vegetarian Times) to make a main course by adding in tofu and quinoa. 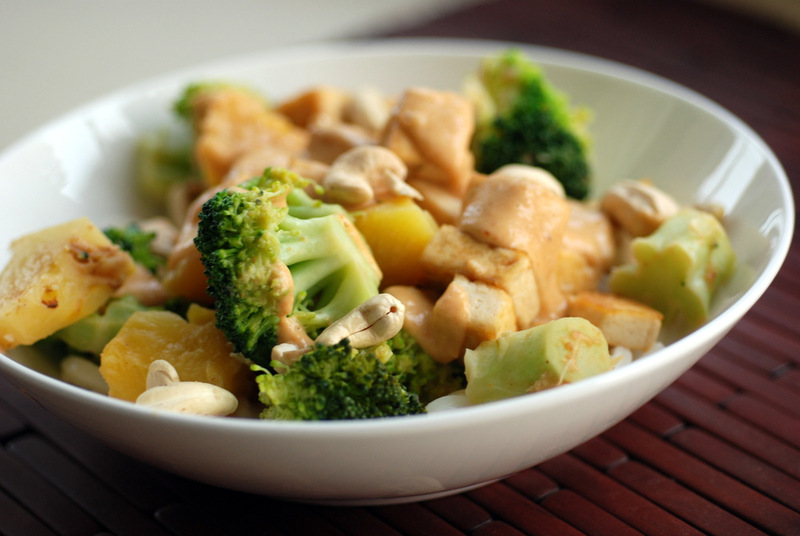 I added in 1 lb of extra-firm tofu and marinaded it in the sesame oil, canola oil and agave nectar. I prepped the rest of my vegetables as it marinaded, although if I had more forethought I would have marinaded it longer. I threw the veggies and tofu together to bake for ~75 minutes, then tossed with a sprinkle of fine coconut and lime juice and sprinkled chopped cashews overtop. Perfect! 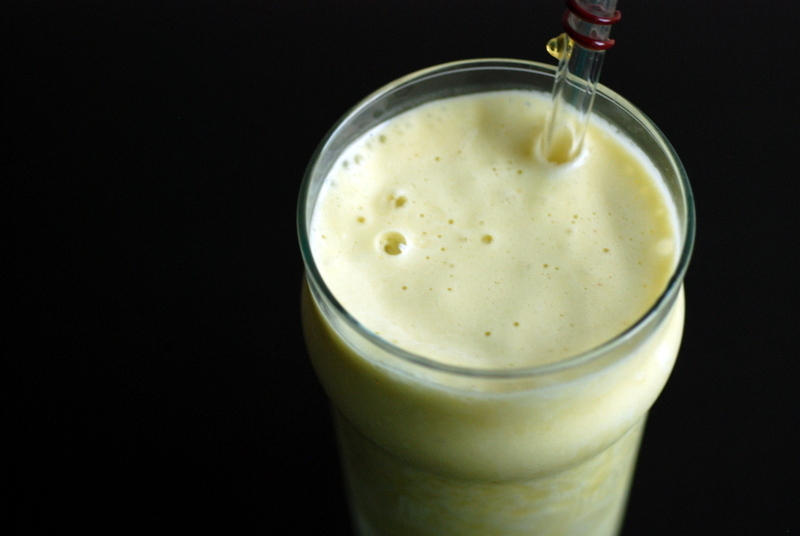 This recipe definitely warrants fresh pineapple, though (I used half a pineapple). The canned stuff won’t make this meal shine. This is my submission to E.A.T. World for Hawaii. It is always good to eat more fruits and veggies. Personally, I don’t have a problem eating fruit, but always looking for ways to eat more vegetables. Fruit is a perfect snack food. Take an apple: Wash and eat. It satisfies a need for something crisp, quenching with a touch of sweetness. It is also a lot more filling then processed snacks. There are so many different kinds of apples, you can mix up the texture and flavour each time. Lately, I have been happily exploring new apple varieties: Cameo, Pinata (also called Pinova), Jonagold, Fuji and Braeburn apples, which have all been great for snacking. The apple is my standard fruit. I usually eat one or two a day and have yet to grow tired of it. Berries and tropical fruit make me giddy, though. If they weren’t so expensive, I’d be eating them all day long (score for when they are all on sale at the same time!). Most often, like apples, they are great untouched. They are so sweet, you don’t need enhance their unblemished taste at all. Certainly you don’t need to do anything, but yes, it can get better. I dare you to make this salad. 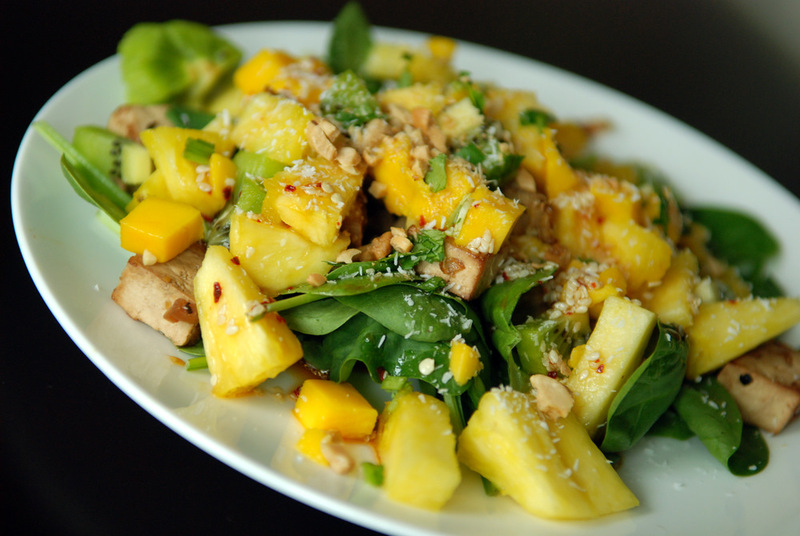 This is my submission to this month’s Veggie/Fruit a Month, featuring mango, to Healing Foods featuring pineapple, to E.A.T. World for Thailand, to this month’s Ingredient Challenge Monday for pineapple and to Deb for this week’s Souper Sundays. I have written about the Nutrition Action Health Letter before, which I describe as the consumer reports of healthy food. I used to borrow my mom’s old copies, but since she has stopped her subscription, I have resorted to reading the free online archives. I am so glad I did because I stumbled upon their vegetable ratings from early 2009. They ranked vegetables according to how much a serving of each vegetable contributes to our dietary reference intake of calcium, iron, potassium, folate, vitamin C and vitamin K, plus the percentage contributing towards our daily value of iron and the daily targets for lutein and other carotenoids. Certainly there isn’t a bad vegetable (mushrooms? eggplant? I still love them!) but there are superstars, too. Their winner of the veggies, by a landslide at that, was KALE! 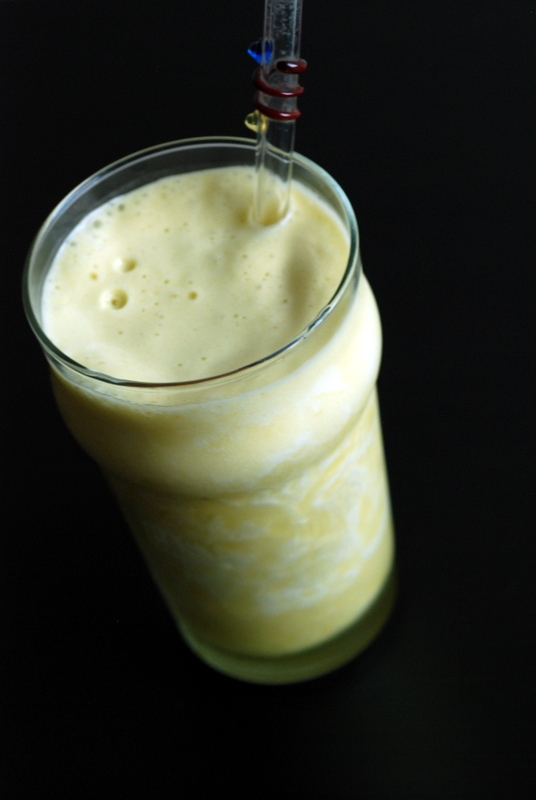 With just a cup of cooked kale, you exceed your daily requirements for vitamin K (1300%!) and vitamin A. It is also an excellent source of vitamin C and manganese. I still had two pounds of kale left over from the Cranberry Bean Mole with Roasted Butternut Squash, so I searched for more ways to use kale. 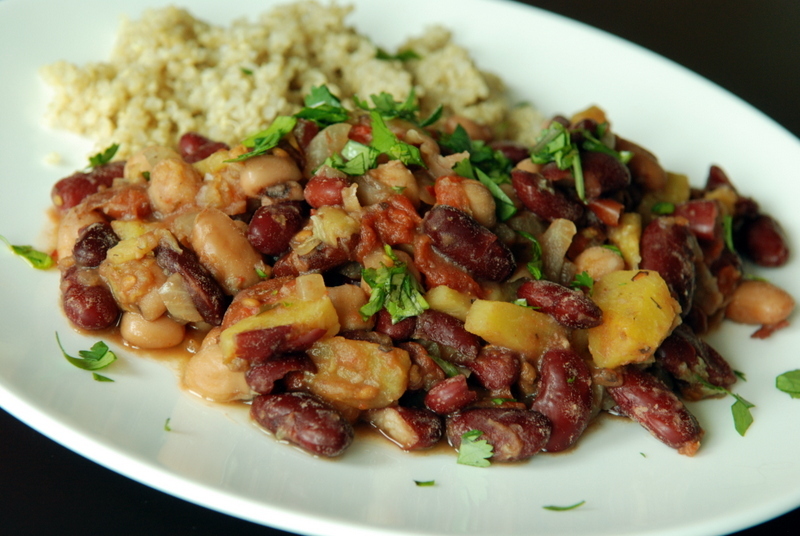 I had bookmarked Susan’s African Pineapple Peanut Stew a long time ago, and I stumbled upon it again while flipping through Moosewood Restaurant Cooks at Home. Unlike the mole, this was a quick and easy dish to prepare. This is an unusual dish, not a typical stew by far, but let me assure you that this tastes great. The flavours work wonderfully together. First and foremost, this is a kale stew. 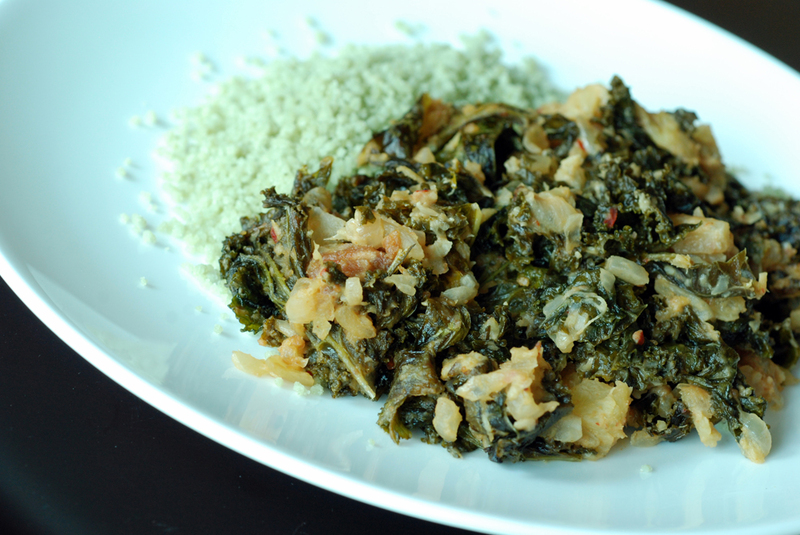 I enjoyed the coarse chopped kale, as there was a nice texture to bulk up the dish. Others may prefer it shredded, like in a curry, so I’ll let you investigate. 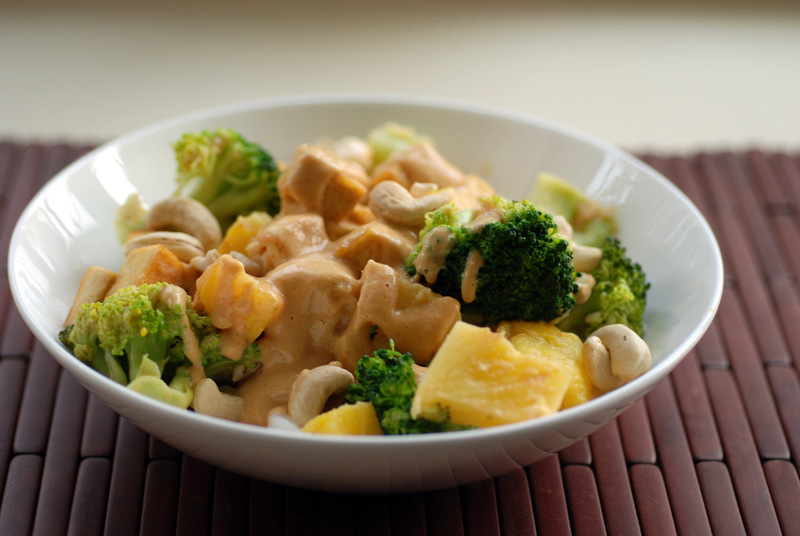 Sweet, crushed pineapple is added, and it is cooked in a slightly spicy, creamy peanut butter sauce. Be careful when you add in the peanut butter – it can do a doozy to the bottom of your frypan. You might not think this is filling, but trust me the peanut butter does the trick here. 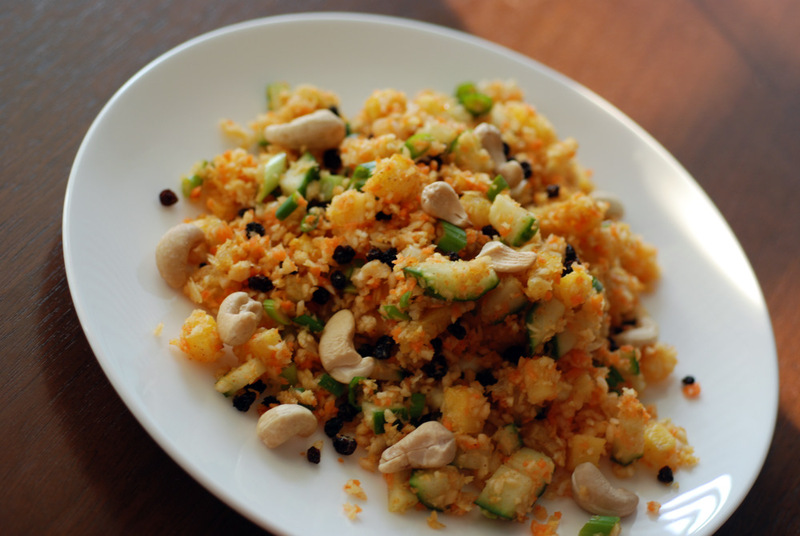 Continuing with an African theme, I served this alongside couscous, and found that this really made the dish stand out. 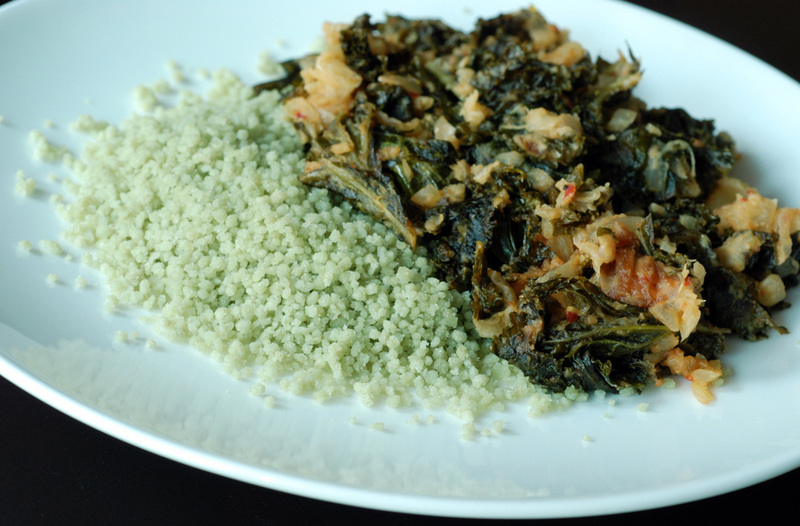 The little pellets of couscous paired well with the creamy kale stew. 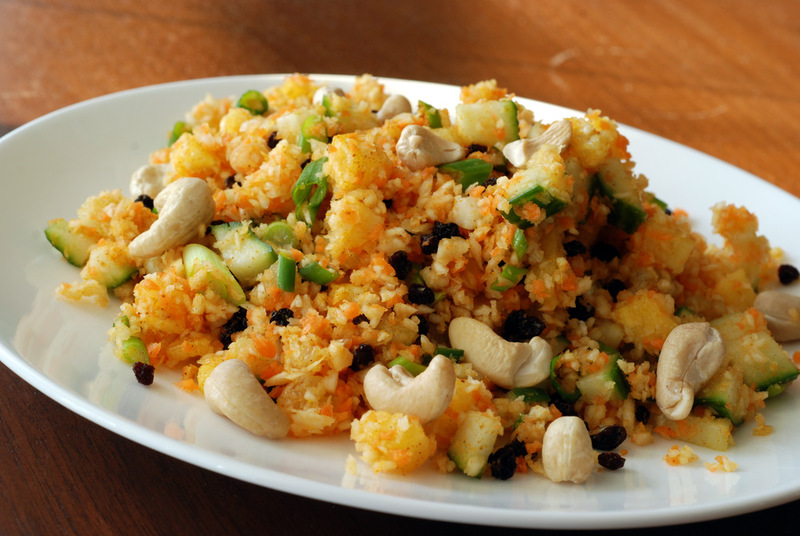 This could be served with rice or any other grain you have on hand. This is my submission to this week’s Presto Past Nights, hosted by Helen at Fuss Free Flavours and to Torview for her green Food Palette event.